Everyone knows by now how much I hate cooking of any sort. But, I realized that I should at least be cooking the occasional egg for my parakeets. Eggs are a great source of protein and beyond that it’s a good idea to keep parakeets lives’ enriched with new experiences and a varied diet. 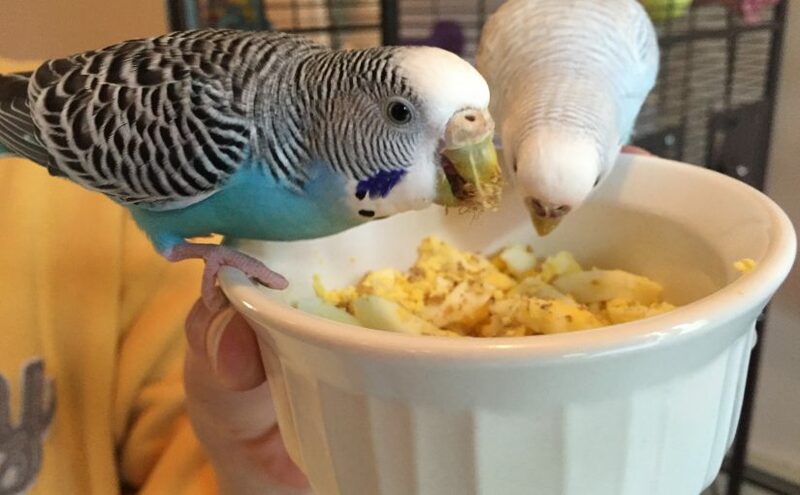 So – although I rarely step into the kitchen for my own cooking, I decided to make eggs for my parakeets, and found that it’s easy enough even I can manage! First of all I had to figure out how to cook the eggs. Initially scrambling seemed logical, because I could easily mix the scramble with millet or fruit or really anything they’ve enjoyed before, thus increasing the chance of acceptance. On the other hand, I couldn’t figure out how to make a successful scrambled egg without adding butter to the pan, or some other type of oil that they really shouldn’t have. Of course we don’t use Teflon, so the egg would be sure to stick. Then I realized it would be much easier to hard boil the eggs and mash them up. I bought a 6 pack of eggs, and then they expired, so I bought another carton of eggs, and let those expire too! I know that food waste is terrible and I have a lot of guilt over those 12 eggs, but it’s an accurate illustration about how much I avoid the kitchen at all costs and how little we use eggs in my home in general! – Fill a pot of water, cover it and put it on your range on high heat. 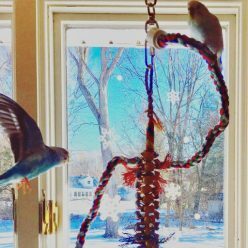 Make sure your birds are safely stowed in another room or in their cage. – Once boiling is achieved, put eggs in water and don’t re-cover. I used a pasta spoon so I could gently float them into the water. One broke, I’m not sure if it’s because they were right out of the refrigerator and very cold. – When the timer goes off remove eggs from boiling water and place somewhere to cool. Do not serve your budgies eggs that are still very hot! Be sure to turn off your burner too. – After the eggs have cooled for quite some time, shell one and mash it. The whites and yolk can both be eaten by parakeets. I mixed some millet in with mine so they would be more likely to try it. Put the rest of the eggs into the refrigerator where they will be good for one week. After one week they should be discarded. I did my usual song and dance to sell the parakeets on the new food while shelling and mashing the eggs. Their plates were all dirty already and they had to have their egg in a bowl so that may have hampered their interest. They did both try it, even if it was only by accident while digging through for the millet. Since the eggs are good for a week, I have devised a plan to get them more interested. On Saturday morning when I take their seed out to change it I will put back in mashed up egg and some veggies with seed or millet mixed in and hopefully they will be so hungry for their breakfast that they’ll feast on eggs and veggies. I know, I know, you’re saying to yourself “Kristen that is basically the definition of “chop” and you said you’d never make chop because it’s way too difficult”. That’s true, but somehow starting with the egg base and thinking of it as a Saturday treat makes the concept a bit easier to handle. We’ll see if I actually manage to make it happen anyhow. At the very least I am now comfortable with boiling eggs, and I’m excited to add another dimension to the parakeets’ diet.